Herndon, Virginia, July 2, 2018 —Education is not one size fits all. Students learn in different ways and have varying needs. That’s why innovative educators across the country are implementing creative programs to better meet those needs. The Fuel Education® Transformation Awards program celebrates schools, districts, or organizations that are successfully transforming the way teachers teach and students learn. Boulder Valley School District (Colo.) – for improving graduation rates and meeting student needs by providing online options for credit recovery and supplemental learning. California STEAM San Bernardino (Calif.) – for supplementing online coursework with innovative projects like virtual makerspaces, STEAM fairs, coding workshops, drone-enabled virtual field trips, and more. Genesis Innovative School (Ala.) – for implementing full-time, statewide virtual school opportunities to provide students with rigorous online courses in a learning model that meets their individual needs. Newman Crows Landing Unified School District (Calif.) – for individualizing instruction using real-time data from an engaging adaptive learning tool to boost elementary classroom performance. Orestimba High School (Calif.) – for creating a new way for students to study and explore their interests via access to online courses at a rural school with a 100 percent graduation rate. Southwest Plains Regional Service Center (Kan.) – for giving dropouts and at-risk students an opportunity to earn a high school diploma and expanding access to online courses to hundreds of students across the state. Watson Institute Social Center for Academic Achievement (Penn.) – for providing a personalized, yet flexible and stable learning experience for students with high-functioning Autism Spectrum Disorder. Each Transformation Award winner uses FuelEd’s portfolio of online courses and adaptive learning tools to meet the varying needs of their students, which represent different demographic, economic, and geographic backgrounds. The winning programs are inventive in the way they use online learning to overcome challenges, whether it is by providing students with the means to earn a high school diploma after dropping out, filing teacher vacancies, helping students recover credits, differentiating instruction based on real-time progress data, or providing students with access to a wider variety of elective courses. For details about this year’s winners, their programs, and how they are using FuelEd solutions, visit https://resources.fueleducation.com/transformation-award-winners. 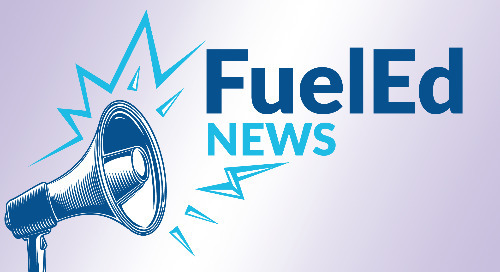 Fuel Educationâ partners with school districts to drive personalized learning and transform the education experience inside and outside the classroom. The company provides innovative solutions for pre-K through 12th grade that empower districts to implement successful online and blended learning programs. Its open, easy-to-use Personalized Learning Platform, PEAK™, enables teachers to customize courses using their own content, FuelEd courses and titles, third-party content, and open educational resources. Fuel Education serves more than 2,000 school districts, offering one of the industry’s largest catalogs of K–12 digital curriculum, certified instruction, professional development, and educational services. To learn more, visit fueleducation.com and Twitter.